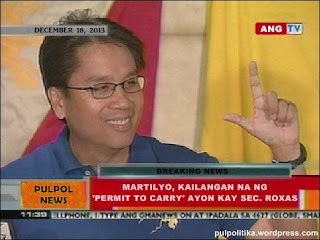 Satirical News: Shippaiman Episode Four "The Hanma Gang" Further Hurts Mar Roxas! Shippaiman's latest episode "The Hanma Gang" focused on the ridiculous proposal of Mar Roxas to ban the sales of hammers in the malls. In this Shippaiman episode, the Hanma Gang is acted by the Ninninger cast (as guest characters using their first names in Ninninger but no surname was given). The Ninningers now play as villains who wreck havoc in Japan using hammers to cause trouble around Japan. Manabu Rokuda stupidly proposed a new countermeasure that will ban the sales of hammer in the malls of Japan to counter the Hanma Gang. The recent problem has that the Hanma Gang has caused damage to several malls in Akihabara. Several Filipino tourists were injured off-screen by the Hanma Gang and were hospitalized. Worse, the new cast member Chikako Sonozaki (acted by Mie Nanamori) is the new welfare minister of Japan. She agrees to Manabu's idiotic plan and implements the plan that no more hammers will be sold at the malls. Instead, they will be sold only outside the malls as a "solution" to the problem. The problem doesn't stop as the Hanma Gang only continues their rampage. They managed to buy hammers from other stores and still cause rampage. Manabu then plans to ban the use of hammers all throughout Japan and makes a list of other items to ban as well. In response, the Winsbraindraft team has Takeru and Jules unleash their security measure. They implement tight security in one mall that refused to comply with the idiotic law by Manabu. Shippaiman tries to fight the Hanma Gang only for them to beat his "fancy armor" up with hammers. Takeru and Jules manage to stop the Hanma Gang with proper security measures. The mall announces they're still selling hammers and that the Hanma Gang have been apprehended by the Winsbraindraft Team. Shippaiman is seen with his metal hero suit dented by the hammers of the Hanma Gang. The Ninninger cast then expressed their thanks that they were able to participate in Shippaiman. The Filipinos who participated in Shippaiman were grateful to have taken part in the epic Tokusatsu comedy series Shippaiman. Sayaka Akimoto is confirmed to return to Japan to film her guest role as Pia Wakamatsu. Mar Roxas simply got outraged at Japan. He said, "See what the parliamentary system will do to the Philippines. It's making fun of me!" He was last seen badmouthing Japan with his wife Korina Sanchez-Roxas. Mrs. Roxas then explained, "Well I hope a tsunami will drown Japan for making that accursed blockbuster Shippaiman!" Prime Minister Shinzo Abe said, "Unfortunately, Korina is a sore loser. Shippaiman gives a warning to us Japanese to what may happen if we're not careful with who gets into power. Furthermore, Korina's persona non-grata is lifted so Japanese can beat her up should she ever arrive."